Fabulous sunset tonight at the marina, the last rays of the sun showing a perfect blue sky streaked with pink. I was at the end of MasterB’s lead and camera less, so I witnessed but did not record it. After a hot afternoon, the evening temperatures have dropped low enough for me to close the windows and think about putting in a jumper. Hils I was out small creatures were flying close by me. It was dusk and they were moving fast so I couldn’t see them clearly, but I think they may be bats. MasterB sat still on the grass staring intently at something I could not see for a quarter of an hour before I decided to end his sortie. But before you feel too sorry for him, we had by that time been outside for forty minutes. I had hoped he’d have a pee, and my hopes were raised when he investigated the soft earth, but it was only to sniff, he waited until he was back on board to empty a bladder that was obviously very full. No worries about crystals and cystitis tonight. I feel like someone who has got behind with her homework; no posts for a week, and the less I post the less motivated I am. Is this the beginning of the end, or just a bit of a pause? So just a few random thoughts about the last week or so while I catch up. British politics continue to bemuse and frustrate me. Goodness only knows where or what the Labour party will be in twelve months time. Theresa May, our safe pair of hands, has suggested that people who live in homes where the government would like to frack could receive financial compensation. Sorry, but to me that makes no sense. Fracking makes no sense; the risks far outweigh the advantages, surely we should be investing in sustainable energy? And those people who live on that land are only the temporary custodians, the effects of fracking are something that future generations will have to deal with. The local feline population has quadrupled over the last few weeks. The mystery of the pretty tabby has been solved, and she’s a he, so I got that wrong. My neighbour Wendy has been rather hoping he’s homeless, but it turns out he is called Romeo and is the loved cat belonging to the local Kurdish supermarket. The manager was both surprised and amused to learn Romeo has been exploring our garden. So that just leaves us wondering if the scruffy black cat with the white bib, the white and ginger cat, the two huge cats that look like pumas, have homes. The two fluffy black and white cats live over the wall; I think the smart (as in appearance, his IQ is questionable) black cat with the white bib is Johnny from over the road, and there seemed to be another tabby tonight. I am going to be on litter tray duty for a while yet. But MasterB is still enjoying his new wobble biscuit toy, which from my point of view is great, as it doesn’t roll away and get hidden or stuck in awkward places round the flat. Downton Abbey? You can keep it; Eastenders in posh frocks. Coronation Street? Never watched it, though Ena Sharples was a well known name in my primary school playground. Holby City? Phuh. I am not the greatest television watcher, mostly because I have a very small television that makes it less of a relaxing pastime and more of one where you have to stand up and close to the screen so as to see what is going on. And I write as someone who only has myopia in one eye. But every now and then I am gripped by a series. Wolf Hall earlier this year hardly counts as it was a transcendental adaptation of two transcendental novels. Anyway, I saw most of it on Celia and Charlie’s proper sized television. For a series, other than things like Paul O’Grady’s For the Love of Dogs to which I am completely addicted, to get my full attention it has to be pretty good. Or the Olympics. Short silence while I relive the joy of standing a foot (31cm to my metric readers) from the television screen while Mo Farah, Jess Ennis, Hannah Cockroft and David Weir did their stuff while I shouted encouragement to their unhearing ears. Back in 1996, quite by chance I caught the first episode of This Life. I was gripped. Immediately. I spoke about it to everyone I knew. No, no one else had seen it. Zero interest. So it was with a degree of cynicism some weeks later when This Life had become an unmissable televisual event in the circles in which I swim that I listened to those same people swearing that they had been into the programme from the word Go! I love Ray Davies, and Waterloo Sunset is probably the best hymn to London ever written, and hearing a Beatles’ recording beat a live Macca hollow,but the moment I felt engaged with tonight’s closing ceremony was when they showed the footage of the highs and lows of the past two weeks. Until that moment, I thought I might switch off and read my book. It has been an amazing two weeks. I freely admit I did not want London to win the Games bid. My friend Sarah was in Trafalgar Square when the news broke and was ecstatic. I had a more cynical attitude. Tonight finds me in the Netherlands in a small town not far from Amsterdam. I have never flown here before. My journey has always been by boat so this was my first time at Schiphol Airport. Does anyone else remember, decades ago, how Schiphol Airport bags were cool? I have no idea why. I believe they were yellow. Maybe the airport itself was cool and some of that cool rubbed off on the bags. I quite liked the airport, although it was a very long walk from the plane to baggage reclaim. I haven’t ever been on a plane with so many people wearing orange. And I am not talking about the Easyjet crew. Olympic rings adorned bags and t shirts. Some passengers had Dutch flags on their cheeks. I had my Olympic weather badge. It looks like a shiny, pretty present, exciting, full of promise. But things are not always what they seem. Stop the Traffik is raising awareness about human trafficking, and aims to keep these Olympics traffic free. 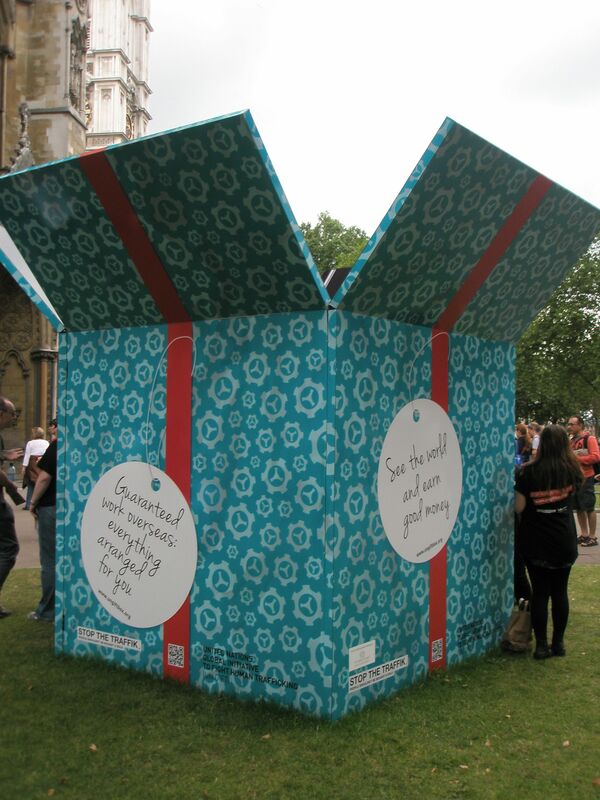 This Gift Box is just outside Westminster Abbey. It is a sobering thought that people are still being bought and sold, that people are brought into this country by individuals who keep them prisoner and who exploit them. To find out more about this campaign click here. To find out more about this week’s photo challenge click here. OK. Time to fess up. The Olympics, Lonodon 2012, is nearly over. I am leaving the capital on saturday for a week; missing the closing ceremony and hoping that the time away will help me cope with an Olympicless London. By the time I get back, the run up to the Paralympics should be building. I dare not think about September. Rebecca Adlington awes me. She is generous, talented, gifted. I am appalled that since winning two bronze medals her profile here has dropped. Her attitude embodies everything the Olympics purports to stand for. As a role model, she is hard to beat. I don’t know what number of Olympic posts I have put up. I said this one was my first. But it wasn’t. It was probably my third. My excuse is that I didn’t know my real first Olympic post was my first. I thought it was about the new James Bond Film. I was almost right. I had, however, forgotten about this one with the Olympic rings on Tower Bridge; and this one, where the artist seems completely out of key with the rest of London. Since every day for the past goodness knows how many has been dominated by the Olympics, I have no idea how many of my posts have an Olympic link anymore. Anyway. Here are some pix from today’s haul, all part of the Cultural Olympiad. First up, the House of Flags in Parliament Square. 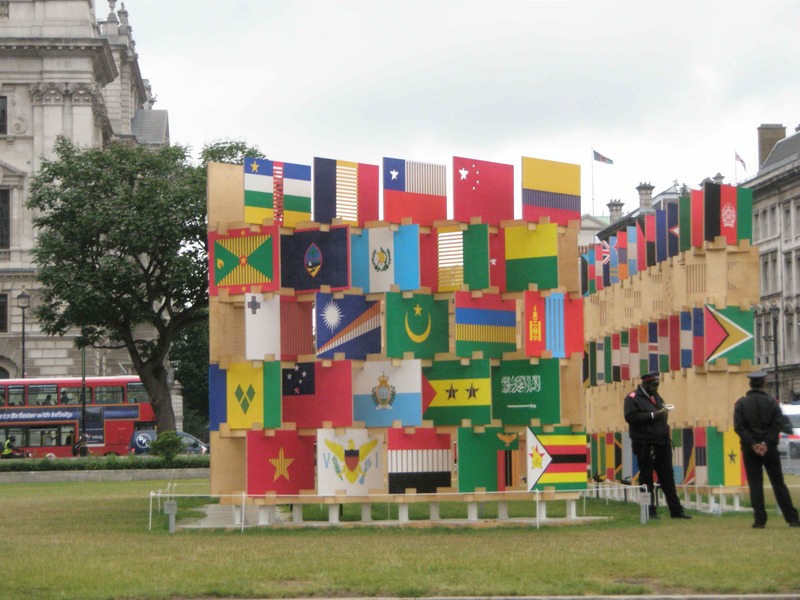 A House of Flags is unveiled across from the House of Commons. 206 panels present the flag icons of all the nations participating in the 2012 Olympics and Paralympics. Combined they make a large building jigsaw, a united ‘House’. A matrix of symbols, shimmering colours, shadows and perforations invites everyone to experience an image of the world as well as an image of multi-ethnic London.